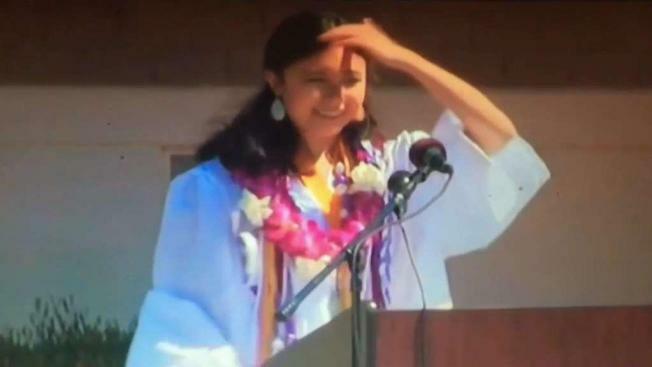 The valedictorian of a California high school says school officials cut off her microphone during her graduation speech after the 17-year-old senior veered from the administration's preapproved script. Petaluma High School senior Lulabel Seitz began her commencement address by talking about the obstacles her fellow classmates persevered through in order to graduate. She noted the devastating wildfires in Northern California and being in school during a teacher strikes. Seitz then started talking about a personal struggle: she had been sexually assaulted on campus, she says, and the school did nothing about it. That's when someone pulled the plug on her microphone. "We are not too young to speak up, to dream and to create change, which is why when some people on this campus, those same people ..." Seitz is heard saying before her microphone abruptly cuts off. When her classmates realized what was happening, they stood up, cheered and began chanting "Let her speak." Students clapped in support as she returned to her seat during the June 2 ceremony on the school football field. Seitz said later that she was "unfairly cut off" for trying to address the silencing of victims of sexual assault, though officials said all speakers had been warned the microphone would be muted if they went off message. Principal David Stirrat said the school had been tipped off in advance that Seitz might deviate from her approved remarks. Seitz said the school administration feared the truth. She posted a video on YouTube of her interrupted speech and added an uncensored version of the full speech she tried to deliver. In the expanded version, she said students hadn't let it drag them down when some on campus "defend perpetrators of sexual assault and silence their victims." Seitz said she was sexually assaulted on campus by someone she knew and wanted to show frustration for a lack of action by the school. "The person didn’t get any consequences, and he was even there at graduation watching me give my speech," she said. "And that’s just not fair to girls." District officials did not respond to NBC Bay Area's request for comment. The school district told The Press Democrat they couldn’t comment on the alleged sexual assault, citing student privacy laws. Legal experts were split on whether the school had the right to stop the speech. Seitz has a strong case for challenging, they said, especially because she was not using obscenities or disrupting the crowd. Seitz, whose grandparents immigrated from the Philippines, is the first member of her family to graduate from high school. She will attend Stanford University.